Claps, Clinks and Clatters, Capture all the Commotion with ReCap! Every student should be heard! ReCap gives each student voice a avenue to share their opinions, answers, or speaking skills. Question, converse and collaborate with your students. Engage students by boosting their presentational competence. Focus on the 21st century skills that have all the students talking! 1:1 programs can be expensive, but they don't have to be. This nuts-and-bolts session will focus on ways in which the Iowa City Schools are achieving cost-savings while implementing – and in part due to – a large-scale 1:1 initiative. Attendees will have the opportunity to collaborate and strategize as a group. Tech-infused makerspaces provide accessibility and equity for students to work through the design thinking process and bring ideas to life. Students empathize and define problems, generate solutions through ideation, and work through rapid prototyping and testing. Successes and failures are celebrated throughout the process, empowering students to embrace innovation.In this session participants will understand the steps of the design thinking process: empathizing, defining, ideating, prototyping, and testing while working hands-on through the process themselves on a design thinking activity! In this session, we will explain the process we followed to implement digital citizenship lessons at our high school via a building-wide approach. We will explain the groundwork that formed the foundation as well as the steps that were taken to put plans into action. Join me to learn more about how kids as young as 4yo can use Google Apps (Docs, Draw, Slides) to share their learning, create, write, and collaborate with others. Whether you are a pro-gamer or a total n00b, this presentation aims to give you the loot needed to buff student motivation and learning retention in your classroom. With the experience points you farm from participating in this quest, you are sure to level-up your teaching practices. So make sure you join in before this opportunity despawns or you might feel pwned. (And if you have no idea what you just read...you should TOTALLY attend!) Game on! Come try your hand at STEM challenges designed for kids and their parents! Participants will take part in a STEM activity, receive book lists to correspond with activities, printables, and ideas and tips for how to host your own event in your community! We focused on girls, but boys are welcome, too! If we are going to promote and encourage technology in our schools then we also need to teach kids what it means to be Great Digital Citizens or...just teach them to be Great Kids. Learn how to directly involve your students in this process. This session will explore the world of inventing and designing. We'll be getting hands-on with the "invention kit for everyone" Makey Makey. You'll have the opportunity to explore basic inventions and how you can transform a Makey Makey invention. See how Iowa is leveraging community support through a student personalized learning system, providing a conduit for willing Career Technical Education partners to help build personalized learning opportunities for students across the state. Teachers will learn how they can use these free tools in their classes and to meet individual student interests. What if you could engage every student in your class, every day? Pear Deck lets you bring presentations to life with formative assessments and interactive questions. Designed for 1:1 classrooms, Pear Deck takes presentations to the next level, letting you see, in real time, how each student in your class is doing. In this hands-on session, we will let you experience the power of Pear Deck as both a student and a teacher. We’ll walk through how easy it is to 1) Add formative assessment questions right from Google Slides, 2) Manage your class and view student answers with the teacher dashboard, and 3) Capture student responses with our Google Classroom integration and Takeaways. By the end of the session, you will walk away as a Pear Deck expert with a Free Pear Deck Premium Account! iPad is a powerful way to learn, and now iOS 11 delivers powerful new productivity tools. Explore the new Files app, the new Dock, intuitive multitasking, built-in screen recording, and new features in the Notes app. Learn about classroom workflows using the Classroom app, Apple apps, and more. This session will look at a variety of ways to use Google Slides other than as a presentation tool! We'll explore learning activities that incorporate the 4 C's - Critical Thinking, Creativity, Communication, & Collaboration, formatting wizard-y to create flyers, newsletters, motivational posters, social media posts & more to promote your stellar learning environment, and lastly, explore a few add-ons to augment Google Slides -- if you still want to use it as presentation tool! The maker movement is spreading across our great state. Are students at the center of your school's maker culture? I will share how students are taking the lead by engaging with peers, teachers, and community members around what makes a maker at Benton CSD. A room designated for students to network and share thoughts on education. These sessions are unmoderated. Attendees guide the conversation. 1:1 doesn’t have to look the same across your district. Join us for ideas on 1:1 within the classroom and 1:1 where devices go home. This session details the unorthodox mashup of Beowulf, the oldest piece of epic poetry in the English language, and Spheros, polycarbonate robotic balls controlled by iPads and smart phones. Witness the trials and errors of an English teacher and technology integrationist as they blend the 9th and 21st centuries and find success. Journalism and storytelling are “killer apps” that use the best practices of project-based learning to build engaged and digitally-literate citizens. Learn how a rural Iowa district uses this innovative, free project from PBS NewsHour that includes a unique journalism curriculum, IPTV station mentors and the opportunity to share local stories with the world. Get an in-depth look at Clips, a new app that makes it quick and fun for anyone to create expressive videos on iPhone and iPad. Learn power tips and tricks for getting the most out of Clips and discover the infinite possibilities for storytelling, assessment, presentations, and more. Foster a Contagious Culture of Greatness by exploring a Top 10 list of ways a Principal and Instructional Coach partnership can promote innovation, creativity, and fun in your school. Be ready to be engaged, involved, and ready to learn in this interactive session. Discover some of the best apps and websites for cultivating creativity on Chromebooks and learn about new ways to use them when working with photos, video, audio, digital stories, graphics, and more. (Everything shown in this session will also be compatible with Macs and PCs). Are you interested in learning about 6 brain-friendly practices that increases student and adult engagement which leads to improved learning? Plan to participate in a very interactive session where educators will walk away with some examples to use in their classroom or during their next PD session including how technology can be leveraged to enhance these practices! We keep adding more tech, but the Gallop poll shows student engagement is dropping the longer students DO School. Let's not only engage students, but empower them. This hands on session will explore strategies and resources to build a culture of empowerment in a digital age. Academic Opportunity time (AO) is Dallas Center-Grimes High School's take on the Tier 1/Tier 2 piece of MTSS/RTI. We have a dedicated 27 min. in the middle of the day that we organize through a program called FlexiSched. OER? #GoOpen? What is that? I want in! The Open Educational Resources movement is here. OER resources are more than free, they are open to use, share, and revise. Schools are electing to GoOpen, replacing purchased textbooks with OER instead. This session overviews the OER movement, and how to utilize Iowa's OER Commons site within your school. We love to share our journey of creating a combined geometry and physics class through our #futurereadysc initiative! We can tell you all about this awesome and sometimes crazy adventure that has a mix of #edtech, #pbl, field trips, skidding cars and swimming pools with some cardboard and duct tape on the side!! This won't be sit and get so be ready to share your hopes and dreams for the future!! Jamie Bratvold is a secondary math teacher at Sioux City West High. She specializes in analyzing data, classroom management, standards based grading and building fun in the classroom. Are you ready to share the awesome work in your classroom? Maybe you've been doing it and you're ready to turn it over to kids? This session helps participants help students both understand and organize social media production and branding. Topics include digital citizenship, creating content, and global connecting and collaborating. Avoid the trap of using technology as an extra, fun piece of the classroom experience just for end of unit projects or to keep students entertained. Technology is a real tool in the real world and should be in our classrooms as well. Items covered in this session will be changing this mindset along with practical strategies for how to decide to use technology, what to use when you do, and how you can save time, have more differentiation, and help more kids. Bring a device to see some of these strategies in action. We were asked this question as kids, and we ask this question as parents. As educators, we have the tools available to us to positively influence how this question is asked and answered. This session will explore what those tools are and how they can be used in-order to communicate and build strong relationships within the school community. With 21st century skills and 1:1 technology initiatives being implemented in classrooms around the world, there is a need for new assessments to match these individualized skills. Through digital badge systems, students provide personalized evidence of mastery for standards and skills and become responsible for their own learning. This session will focus on the Iowa City Schools' efforts to implement 1:1 with equity in mind. A no-financial-liability approach to this key piece of our curricular offering is supplemented by a program that provides free hotspots for the home, along with remote delivery of specialty software. There’s so much talk around integration of the 4Cs into our instruction. But what does that actually look like? Learn simple ways that you can incorporate and support collaboration, communication, creativity, and critical thinking in your classroom. Let’s dive in and get started! Embrace creation, even on a Chromebook. This session will dive into a few of the multimedia creation tools that will help your students take their projects to the next level! Fake News is not new news. But in our digital society critical evaluation and analysis are more important than ever! How do we help our students and staff? The answer is simple: by building their critical-thinking and information literacy skills! Join us to explore how. Participants will leave this session with a plethora of resources and ideas that can be shared with their students and staff. Are you ready to blur the lines around traditional school with work-based learning? You may be closer than you think! If you have an online platform, a single community partner, and a passion for supporting all students, we've got the spark of innovation to give your students an EDGE. Based my friend on Weston Kieschnick's "Bold School", participants can expect to dig into why technology is great, but teaching is better. Learn how to do more than just substitute what was done with paper and pencil and instead change the learning! Learn how to easily create virtual tours using images, videos, hyperlinks, and descriptions with this powerful tool. Applicable to any content area, search available tours in the gallery or create and share your own. Students can even build tours to demonstrate their understanding of content. During this session, we will explore the iPad app TouchCast (free!) and have students share their learning experiences with the app. We will discuss how using this app allows students to create meaningful, hands-on, and interactive videos. Teachers can also use TouchCast to create flipped or blended learning videos that capture students' attention. This app does everything: green screen, whiteboard, apps, and interactive tools! There will be hands-on collaboration time to receive help learning the app, so please bring your iPad! The early years are a great time to introduce coding concepts as a way of thinking about the everyday and digital worlds. Learn from Apple Distinguished Educators who use iPad to inspire elementary students with cross-curricular lessons in coding from the free Everyone Can Code resources. Technology Integration, Virtual Reality, Osmo, Computer Science/Coding, Swivl, Plickers, Google Apps For Education, Stop-Motion, BreakoutEdu, Kahoot, etc. Struggling to know what to do now that you have access to technology? Participants will learn practical uses for iPads in the K-2 setting using free apps and innovative practices. Session will cover how to move past apps for practice and move towards transformative teaching. Even if you are not a full 1:1 school yet! "Using Technology to Take the Challenge out of Challenging Behaviors....a Closer Look at Social Emotional Learning." Terese Jurgensen & Kelly Sorenson will be presenting on strategic ways to support all students through Building Social Emotional Learning through 4 Lenses: District-Wide; Classroom Settings K-12; Special Education & At-Risk Classrooms K-12 and Individual Student Supports. By attending the presentation, you will be given the opportunity to learn about cognitive brain functions for learning and for self-regulation, why students' brains our changing due to cultural and social factors and a wide-variety of technological supports to take back to your students, your classrooms and your school districts. Terese Jurgensen has 30 years experience working with challenging students and families across multiple seetings, and has been providing professional development on Social Emotional Learning and Challenging Behaviors for over 10 years to a wide-variety of audiences. 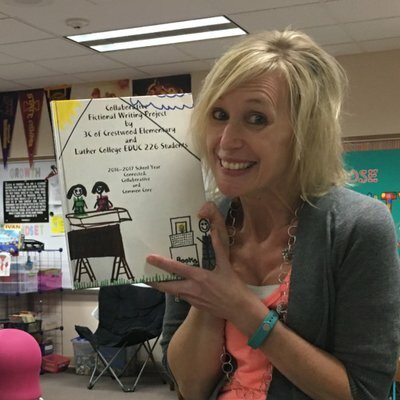 Kelly Sorenson is an instructional coach and educational leader supporting teachers and students on a wide-variety of subjects, one of her educational passisions is to improve student achievement and motivation through technology supports and strategies. Partnering together, Mrs. Jurgensen and Mrs. Sorenson are honored to share at Iowa's 1:1 Institute. Howard-Winneshiek CSD was recognized in 2017 for its outstanding work in Social Emotional Learning by the Iowa Department of Education. Through these district-wide efforts, office referrals have decreased over 50% and positive school attendance has increased over 50%. Hear from districts who are moving toward blended learning. We will discuss why you might want to take this leap, what to think about before converting a course to online, the challenges and tips for a successful online course. This session will also share with participants the opportunity to participate in a blended learning cohort as well as an Online Learning for Iowa Educators community. This session will cover tips and tricks on how to make coaching easier and more organized thru technology. These will include Screencastify, Google Forms, Awesome Screenshot, and more. Why Does Google Keep Changing That?!? One of the joys of using Google is that they are constantly updating their services. One of the frustrations of Google is that they are constantly updating their services. Come and check out some of the new updates in Sites, Calendar, and "Google Meet." There is no promise of a comprehensive list because they probably updated more last night. This session is an unstructured conversion about leadership and 1:1 schools. Participants should come prepared to ask questions, contribute ideas, and drive the conversation. Notes from the session can be found here. Actively Learn: How to Help Every Student Read for Depth. Reading for depth is hard. Actively Learn can help. In this hands-on and interactive workshop, we will show you how to:- Access high-quality digital content across all content areas. - Increase student engagement, improving writing and comprehension. - Scaffold lessons to support and challenge all readers.About us:Actively Learn is an online literacy platform used by schools and districts to ensure every student reads for depth. With Actively Learn, teachers can more effectively implement research-based practices to activate, support, and reveal thinking for every student. Our approach is supported by the Gates Foundation, National Science Foundation, and has been used by over 1 million teachers and students across the country. Have you been challenged to transform your teaching craft for personalized learning in ever increasing virtual realms? Explore how to reshape teaching practices producing champions of technological avenues while creating intentionally successful classrooms. Consider together using the Iowa Learning Online Pillars of Instructional Quality in Branch Out, starting your own local vitual learning program as a job-embedded professional learning opportunity. This session will focus on google sites as a vehicle for students to curate their artwork. Simultaneously, integrating art skills, literacy and the 4 C’s of technology in line with an authentic audience. Participants in this session will view high school student examples, 4. Scale Criteria and planning insights. Harness the power of the doodler with Sketchnoting basics. Sketchnoting is an empowering way to teach the doodlers in your classes how to channel their scribbles into visual gold. Our students are bombarded with visuals everyday. In this session, let’s doodle! Learn basic symbols, tips and tricks transform your notes. Then pass that on to your students. Move beyond book reports and multiple choice tests! Engage your students with digital tools that will encourage your students to share their unique insights. Create a culture of readers that engage in conversations around the text, not just summarize and regurgitate! 4 elementary teachers in Sioux City have made a commitment to being #futureready using technology to meet the 4 C's of Critical Thinking, Creativity, Communication and Collaboration. Their integration includes programmable toys, NearPod, FlipGrid, Office365, Tynker, SeeSaw, Storybird and more! If you want your students to be #futureready, do not miss this! WorkFlowy is a zoomable and shareable document that provides an excellent way for students to organize materials for research papers, classes, and school. When used for a research paper, the students were able to cut out the notecard option, link each note to the source it came from, differentiate how many notes they have from each source, and see in a glance what they still need to find information on. WorkFlowy can be a great way for students to not only organize their thoughts for papers, but also provide organization throughout daily life. Are you wanting to see more teachers use project based learning in their classrooms? And are you thinking that PBL is too big of a step for your teachers? Do you want to know how to set teachers up for success so that it is easy for them to succeed and hard to fail? Are you wanting to know how instructional coaches and principals can play a role in this process? If yes, then join me for a practical session that will provide you with ideas to move teachers forward toward Project Based Learning including processes, tools, and a PBL continuum. This session would look into various add-ons for Google Docs, Google Sheets, and Googe Slides. These would include add-ons that allow for teachers to add rubrics to Google Docs, create bibliographies in proper format and so much more. Ways to use videos that you create in the classroom. See how creating and using personal videos can help students learn better and allow you to duplicate yourself in the classroom. You can create videos for procedures, demonstrations and even sub lessons. It doesn’t have to be fancy to work! I am a K-6 Art Teacher who is excited about how using video as a teaching tool has enhanced my classroom. None of us have the same starting point, and we all travel on different paths. So how do we move forward together? What are the structures and supports that can be put in place to optimize our growth and learning? Two principals share what they've done to foster a culture of personal, professional growth. We live in a media rich world. How are we amplifying our student voices to inspire change? Come check out how students were empowered to share their passions through podcasts that they created in WeVideo and published through Flipgrid. We will explore the lessons learned from my failures, but leave with the tools and strategies needed to begin amplifying your students’ voices. Join me as I share my implementation of Blended Learning. I will share digital resources that drive my instructional path for each student and how these resources enhance students’ learning process. We will discuss student benefits, how blended learning has simplified my life, and my successes and learning points. A little bit of innovation goes a LONG way. Create a contagious enthusiasm with your students & colleagues! Walk away with a multitude of strategies to enhance blended learning environments by being intentionally reflective, celebrating innovation, embracing creativity, getting messy, and HAVING FUN! Every educator needs an effective coach! We talk about engagement all the time, but what is it? Activity? Entertainment? And, if something is really engaging, how do you prove it? This session will look at defining and proving engagement in your classroom. Have you struggled to translate an awesome idea into a practical classroom lesson? Did you find an incredible tool at today’s conference, but you’re not sure if it will improve student learning? The Technology Integration Planning Cycle (Hutchinson & Woodward, 2014) offers a solution to these dilemmas and more. Learn how this research-based approach to lesson planning with technology in mind can help you design multi-modal, student-centered teaching to reach your instructional goals. Dad. Thinker. School Board Member. Aspiring Educational Leader. Come explore green screen technology! Play, learn and explore how a green screen can be used to transform teaching and learning. Empower students to dive deeper into content in a more creative way. Your students can be anywhere their imagination takes them! We'll use the DoInk app, iPads and your creativity to create easy-peezy projects in this hands-on session. Come get stuffed on G Suite for Education tips and tricks and learn about a few other Googley tools to support learning. Participants will learn about creative ways to integrate the core G Suite apps into their curriculum as well as creative ways to leverage Chrome extensions, Google Add-Ons, and other Google tools. Interested in starting a Maker's Space in your high school, but don't know where to begin? In this session, attendees will learn about how Knoxville High School developed its Maker's Space. We will cover everything from setting a purpose, creating a space on a budget, and creating challenges for students to complete. We will also have some of the tools we use in our space for attendees to try out. Lindsey is a 6-12 technology integrationist at Knoxville CSD. Get a look into how this Fifth Grade team has prepared their students to be innovative thinkers, leaders and future ready. Changing your tech culture doesn’t happen without the teacher in mind. Join us to see how Spencer CSD incorporates teachers, coaches, and IT professionals in technology initiatives. Experience how the Student Personalized Learning System offered by AEA Learning Online (formerly AEA PD Online) as a teacher and/or student with a variety of different roles. Come join us to learn more about the Student Personalized Learning System content and ways to personalize and differentiate learning for students. What does a well-designed performance task that integrates technology look like? This session will explore UbD stage two planning for performance tasks. Don’t know what performance tasks or UbD are? No worries! This session will be co-curricular & will review how to design performance based assessments that integrate technology. Teachers of all levels will gain actionable strategies to take back to the classroom to help students construct sound arguments while remaining respectful to the ideas and opinions of others. Attendees will participate in an activity, discussion, and application, while gaining access to readings, videos, and more while working through ways to help students enter a world where talking about race, religion, and politics is no longer something we can (or should) avoid.